« DEATH IN THE YOUNG….AND SUICIDE, NOT BY COP, BUT BY POVERTY. BWCA, 2012. TRIP 60. SOLO TRIP 20. In 2006, we established a scholarship in our name at Vermilion Community College, a 2 year school in Ely, MN, on the Iron Range, at the end of the road to the Boundary Waters. VCC students live on the edge of the wilderness….and poverty. I was at the age where leaving a legacy–the woodpile a little fuller than I found it–mattered, and the scholarship was awarded at the annual VCC scholarship banquet, held in Ely. I have attended 5 of the last 7 banquets. In 2009, I partnered with the Friends of the Boundary Waters , one of those small organizations that has a few dedicated staff and leverages a lot of volunteers, to create a second scholarship. I offered to pay for the scholarship myself; the Friends matched it, and this year, with a new employee in the Northland, he would present it, and I no longer would, which suited me fine. The Friends kept a tall cellphone tower away from Ely, so it would not be visible from the wilderness. Unless you have spent time in wilderness, it is difficult to explain how sounds and sights from civilization can degrade the experience. A cell tower would degrade the wilderness, where cell phones read “No Service,” and one is on his own. Worse, PolyMet is trying to build a Molybdenum mine in the area, which is of great concern to the water supply, due to the toxicity of the element. It is jobs vs. wilderness, except the wilderness gives jobs. The outfitter got money from me, and so did restaurants and motels I used, before I went into the woods. We are going to risk the cleanest water in the US for mining something that is safe until it suddenly isn’t? (Prince William Sound, 1989, Chernobyl, 1986, Fukishima, 2011, Challenger, 1986). The third scholarship was the Brekke/Langhorst scholarship, named for two brave young men, cousins from Moose Lake, Minnesota, who died in Iraq…or as a result of Iraq. One died 7 April 2004, which was almost certainly in Fallujah. The other died from complications of PTSD, which should have been anticipated before we went to war, which was unnecessary and probably illegal. But that is another story. Young men are often the pawns of old white men, most of whom have never spent a day in uniform or served in harm’s way. As a veteran, I wanted to contribute to a scholarship for veterans, and the family honored me by allowing me to do so. No family member has presented the scholarship; I and a few others have. This is a very deep honor for me. So, I had plenty of reason to go to Minnesota in late April. In 2010, I took a short trip, stayed about 3 hours from Ely, and in the space of one day drove to Ely, rented a canoe, did an eleven mile day trip in to Pipestone Bay, came out, presented the scholarships (there are about 50, now), and drove 3 hours back to my hotel. That was a bit much. In 2011, I wanted to go into Basswood Lake, and the ice went out the day before I arrived. However, the weather was not at all cooperative, with high winds, big waves, and frigid water. Not being in paddling shape, I thought in unwise to go into the woods, and camped at Fall Lake Campground, where I was alone, did some day hikes in snow, saw a Pileated Woodpecker, among other birds, and enjoyed myself. This year, I decided to go in overnight and look at the results of part of the Pagami Creek Fire. My wife persuaded me to spend two nights, in case of inclement weather, which turned out to be a wise idea. I flew to Minneapolis, did the usual 4 1/2 hour drive up north, and got settled in Ely for the night. The next day, I got the rest of the equipment I needed, put it on the car, and drove out to the Lake One landing. I got on the water on a bright 60 ish day (16 C), and in an hour found a decent campsite about 3 miles (5 km) in . I was going to rest that day, but the forecast was good for that day and not so good for the next day, so I had lunch, hopped in the canoe, and portaged twice into Lake Two. I expected a wasteland, but it was a mile before I saw any sign of fire. But there were signs. 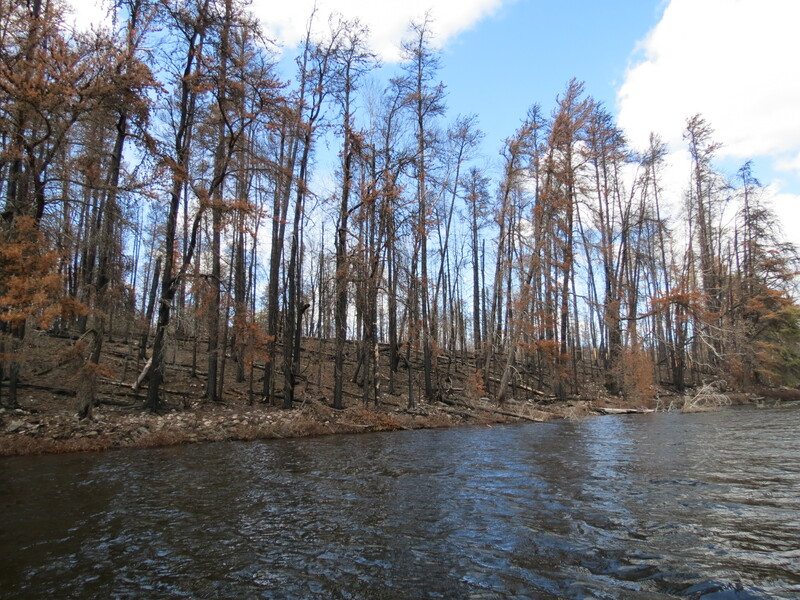 The campsites at the west end had some burned areas, and the beautiful white pines on the west end of the channel into Lake Three were no more, as that area had been subject to a back burn. 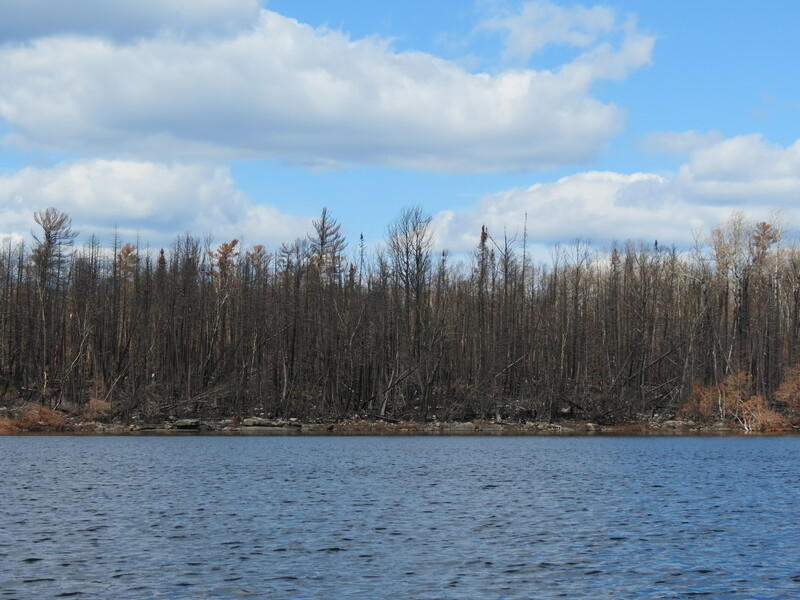 Channel between Lakes Two and Three, with tall burned white pine. 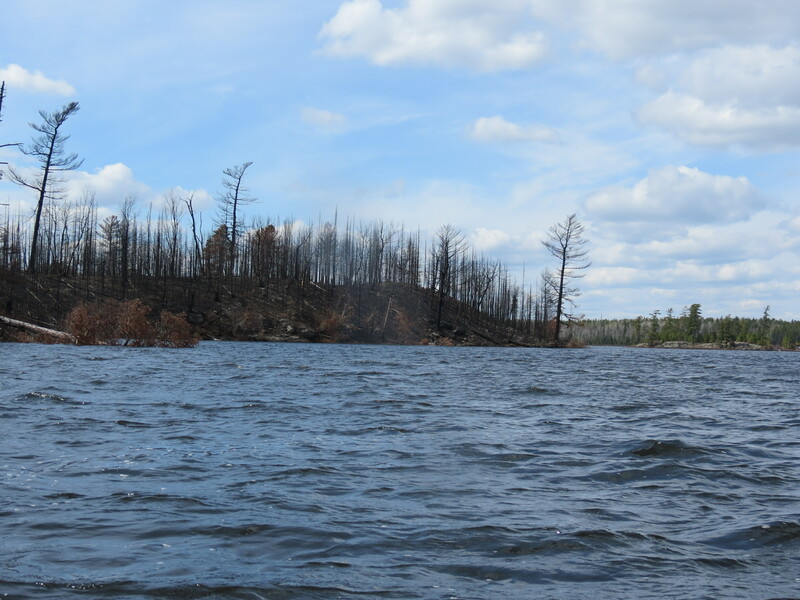 I paddled into Lake Three and was pleasantly surprised again not to see a wasteland but a significant part of the forest was burned. There were mosaics of green amid blackened trunks. The water was more turbid than usual, especially by the campsites, but also along the shore in general. It will take some time for this to clear. Some of the islands were scorched, others were completely untouched. The south end was heavily burned, although campsites survived fairly well, in large part because most of the fuel in this area has been picked over by campers for their evening fires. The wind was a little worse than I liked, and although a 2 foot chop is not difficult to handle, I needed to realize I had about 5 hours to explore, including time to get back to my campsite. Wind, muck , and rapids are three things that can stop a solo canoeist, so I turned back to the north end and started to head back, stopping at one campsite that bordered the fire area. The wind abated, so I took an open channel at the north end of the lake, which I had never before seen open, and went into the northeast bay. The one campsite the late Mike Manlove and I had stayed at in 1993 was in the middle of a heavily burned area, and the north shore was fairly heavily involved. Northeast Bay of Lake Three, heavily burned. I had told everybody I would not go into Lake Four, and I believe firmly in never deviating from one’s itinerary, when one is solo. A lot of bad things can happen in the woods, and solo, what may be minor can become life threatening. I looked around, took some pictures, and then headed back to the campsite on Lake One, the whole 13 miles (22 km) or so taking me a little over 4 hours. I had nothing to do when I returned so lay in the tent, not sleeping, but actually encountering a few mosquitoes, at least five weeks earlier than I am used to. After dinner, the lowering clouds suggested that the next day might not be so nice, and I was really glad I got into the burn area when I did. Indeed, I was awakened to the sound of rain, and I awoke under darker skies although no rain. It was noticeably cooler, too. I hung around the campsite for a while and then paddled about 1 1/2 miles down to Pagami Creek, far back in the depths was where the fire started. I took a look at the western sky, and while the barometer had not changed, I did not think going further was a wise idea. I turned around and paddled back to camp, arriving about 10 minutes before the first onset of rain. It rained off and on through dinner. I was really, really glad I hadn’t gone into Lake Three that day–wind, rain and cold weather would have made the trip a bad idea. I have long learned never to squander good weather in the woods, be it 5 minutes or 5 hours. I spent the evening looking along the shoreline for anything I could find. Such scanning has found moose, beaver, otter and other animals. This time, it was a raven and two crows who provided the entertainment. The raven flew across the lake and landed in a jack pine across the small channel. Two crows were beside themselves and called at him, each other, and probably to the general universe. Periodically, the raven called, too. I videoed the event, catching the raven flying off, still harassed. Random scanning is often interesting. 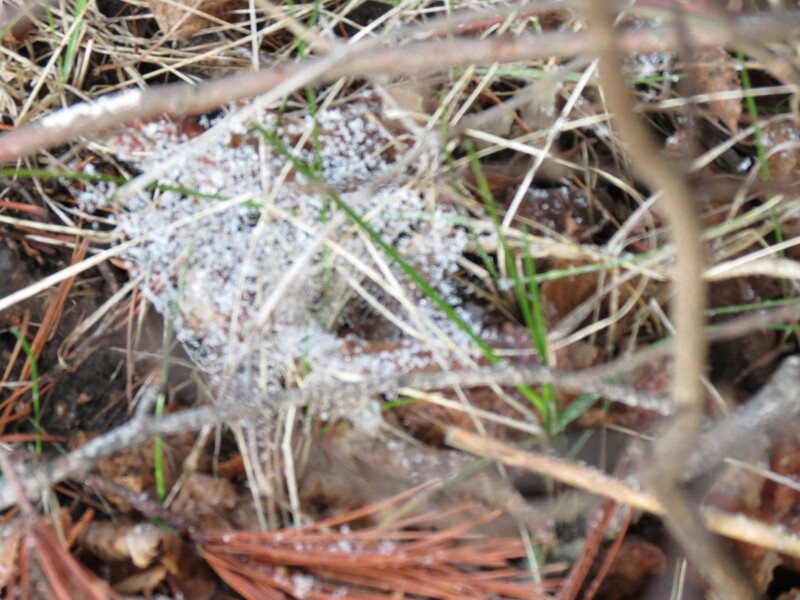 The next morning, the tent was hard, as like a rock, and I went outside to see ice on the tent and snow on the ground! The stove was out of fuel, and while I had another cannister, it was cold, I was coming out of the woods anyway, and I had enough to eat. I broke camp, got in the canoe, and paddled back to the landing. The hardest thing I had to do was horse the canoe up on the car and tie it down. I got my head back on straight. I was out 2 days, and it felt like a week. 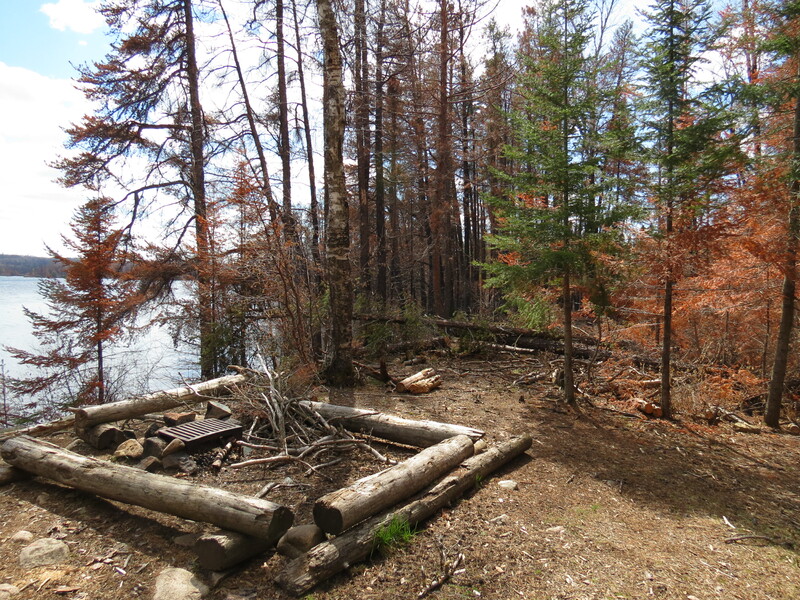 I saw the burned area, and next year, I have to go back one more time to Lake Insula, as sad as seeing the south shore will be for me. I haven’t given the lake a proper good by, and who knows? Maybe we can do our September trips there again, if I find the area isn’t too depressing. One thing is clear–I need to tie the scholarship banquet in with a camping trip. The banquet went well. I met Ian Kimmer, the Friends’ person in the North Country, who presented the Friends scholarship. I presented my two, stayed for the whole banquet, then headed south. We’ll be back in September, headed out Fall Lake into Jackfish Bay on Basswood. It will be a good trip. All BW trips are. 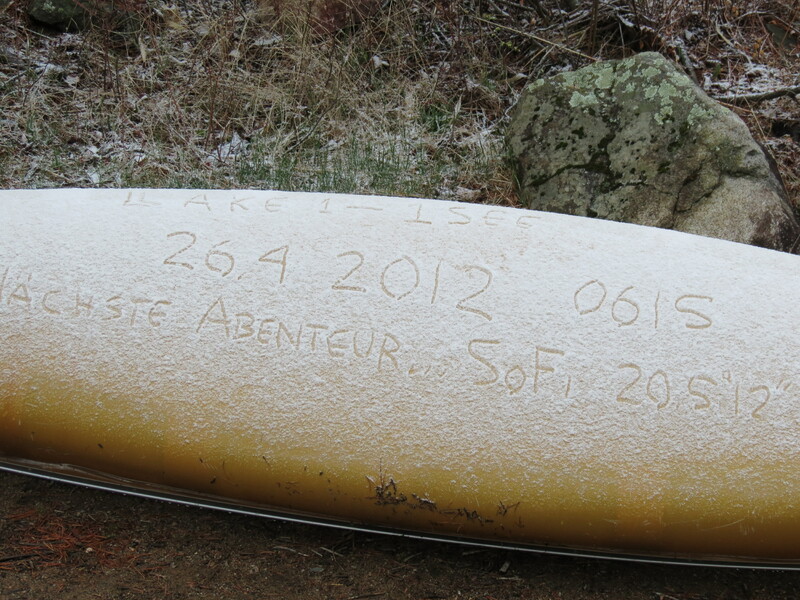 Canoe with snow on it. 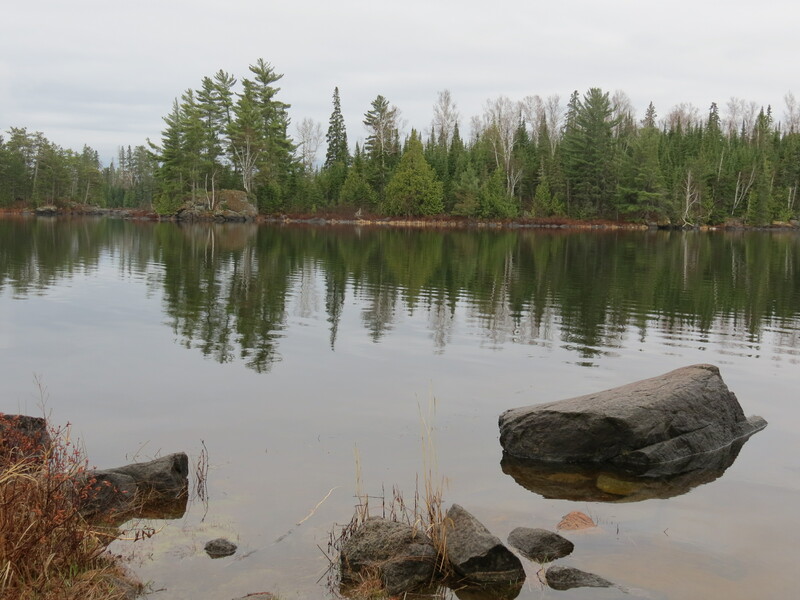 This entry was posted on April 29, 2012 at 13:19 and is filed under BOUNDARY WATERS/QUETICO, BWCAW 2012, UNPUBLISHED OUTDOOR WRITING, VERMILION COMMUNITY COLLEGE SCHOLARSHIPS. You can follow any responses to this entry through the RSS 2.0 feed. You can leave a response, or trackback from your own site.